The 300 tph plant installed for Velde Pukk. 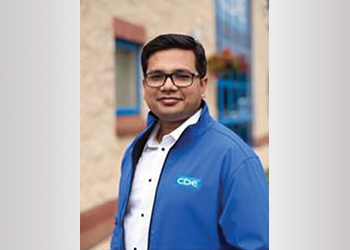 Ruchin Garg, CDE Global business development manager for the Middle East and North Africa (Mena), welcomed the growing interest in effective and value for money systems delivered by wet washing plants for C&D waste in the Mena region. “The cost-saving benefits realised as a result of the diversion from landfill are a major attraction to Mena-based construction companies. With a proven track record of excellence in the development of washing installations for C&D waste, CDE Global experts work with clients to address their specific requirements and overcome any challenges they face. “Our experts manage project design, delivery and installation to respect the essential daily operations of the existing plants on site and minimise commissioning time,” Garg said. 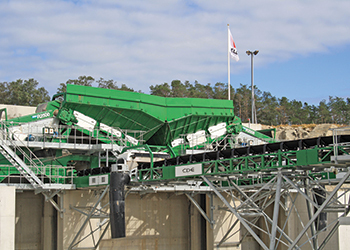 CDE Global has designed and built what it claims to be the largest wet washing plant for construction and demolition waste in the world for Norwegian company Velde Pukk. CDE Global designs and manufactures materials washing and classification equipment with applications in a variety of sectors such as sand and aggregates, construction waste recycling, mining, specialist industrial sands and environmental. To meet the increased demand anticipated for its products and following an upturn in the global construction materials industry, CDE Global has boosted its product assembly space by 32 per cent to allow for the production of 60 additional machines every year. Raymond Cooke, operations director at CDE Global, said: “The year 2015 had been exciting for our company and we have been looking ahead to our growth potential for the coming years. We felt that it was a necessary step to develop a new assembly bay at our headquarters. CDE Global will also launch a number of new products for the global quarrying, mining and C&D waste recycling sectors at key shows like the Bauma exhibition in Munich, Germany, from April 11 to 17; Agg1 aggregates academy and expo to be held in Nashville, US, from March 22 to 24; and Hillhead quarry exhbition in the UK from June 28 to 30. “Our global trade show presence this year is designed to highlight the closed loop nature of our products – from the feed system through to the water recycling and sludge management equipment CDE is a one-stop shop for anyone considering a wet processing project and our global project portfolio highlights our unrivalled expertise,” said Kevin Vallelly of CDE Global. CDE has also been confirmed as a finalist in the prestigious Bauma Innovation Award that is part of the show in Munich.